Two spring outfits with scarves! I'm trying to stretch as much wear out of my scarves as possible before the summer heat sets in. They are really practical accessories for life with baby T! Headed into Brisbane city for the afternoon, to have a look at some of the G20 displays and artwork that was set up. There are all kinds of fun events in the evening, but it's a bit late for baby T to be out, so we just enjoyed the things we can do in the daytime. Also took baby T into the office to introduce him to all of my colleagues and catch up on how things are going at work. I've been away almost 6 months now, and there have been so many changes in my absence! Going to be interesting seeing how many more changes come along before I return to work next year. So thankful for the generous maternity leave we get here in Australia. This tank top is new - one my mum bought for me on a previous shopping trip. I wanted to add a bit of interest to the plain tank, but couldn't decide on a necklace. I thought the scarf was nice, and it wasn't too warm for it. I need to try still get some wear out of my scarves this spring, we will see if the weather cooperates! Thought about adding a handbag, but decided just to carry everything in the baby bag for simplicity. 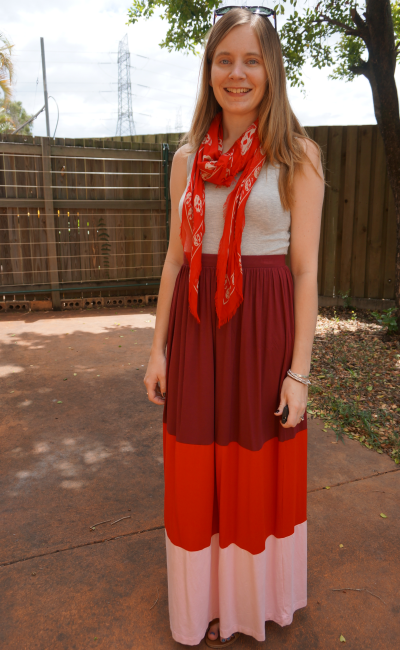 Last worn: Ray-Ban Wayfarers, skull scarf, colour block maxi skirt, Wittner sandals. First time I've worn the tank. A little bit of a dull, drizzly start to the day, so took the chance to wear one of my thicker winter scarves. I ended up taking it off when the afternoon heat hit though. Probably not going to be able to wear it until Autumn comes around next year now. Had an early morning appointment, so dropped baby T off at his grandparents and took my Mulberry Bayswater to hold all the paperwork and stuff I needed. No time to do my hair, so it's scraped up into a messy bun. It is becoming my hairstyle of choice! I was going to wear my little tan flats with this (like I did last time I wore this bag), but decided on the gold ones instead. I quite like it in the photo, but while I was wearing it I did wish I'd gone with the tan flats! 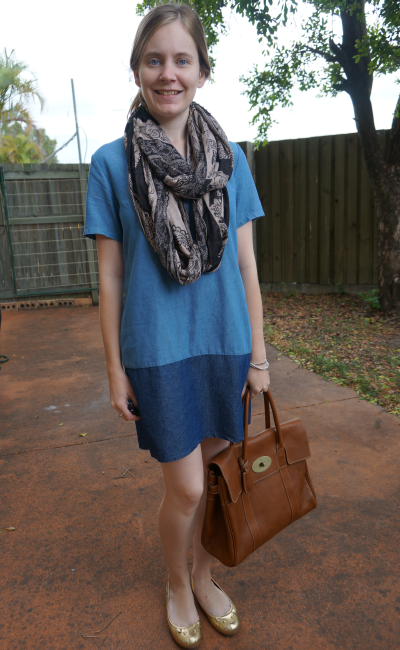 Last worn: paisley print snood, chambray shift dress, metallic mouse flats, Mulberry Bayswater bag. Linking up with Let It Shine, Modest Monday, Style to Inspire, Mix It Mondays, More Pieces of Me, the Daily Express, Real Mom Style, Stylish Tuesday, Style Sessions, Confident Twosday, What I Wore today. Love the Asos skirt. Such pretty colors. very nice look! both of them. I actually still figure which is best. I love it that both of them have the alike detail. very nice! I always love the McQueen scarves! I think the second dress is one of my favorites of yours. I love how Australia prioritizes maternity leave and family. It's so awesome that you get such great time with that baby before returning to work! It is, we are a very lucky country! Love love love the first outfit on you!! How many months do you get off for maternity leave? Its a meagre 12 weeks here :(. Pretty terrible. How is baby T doing? Must be growing up real fast!! We are pretty flexible with maternity leave! We can get anywhere up to 2 years! The government provide you with a year, and some employers (like mine) offer time on top of that. i haven't put any of my scarves away yet - we're still getting some <20c mornings though this thursday is meant to hit high 30s! i really love that chambray dress mica, just gorgeous! Ah I wish it was that cool here! Seriously! I would love to own a Mulberry handbag! You have so many scarves! Love the paisley snood, love the blue outfit best! Love the red in your outfit! Such a stunning colour on you! I love that short blue dress on you. Love the shades of blue. Looks so good. Sorry for being gone for a week! I've been working on my new site and it took a lot longer that I expected but now I am back :) Hope you had an amazing weekend! You have a pretty awesome scarf collection, I love them! I remember when that Alexander scarf came out, I was so in love with it...you lucky gal! we love both outfits and the whole colour-blocking theme. But we must say we're obsessed with the chambray dress!! It's gorgeous! Love your color block dress and skirt! You have such a gorgeous collection of scarves! Hope you get a chance to wear them a little more before it gets too warm! That color block skirt is tooo cute! Super love that color block maxi!!! Come check out my feature/review of Boden's brand new yoga/active wear this week at my blog & let me know what you think! that chambray shift dress really brings out your blue eyes! love the summer scarves! The second look has surely won a fan ! I love the dress and how you added the scarf and flats. I wish I could look like this everyday.